In the warm electric light beneath Westminster in the heart of London, the Prime Minister stares intently at the wall. He is pondering lines drawn upon a massive chart in his underground Cabinet Room. That map records the last known positions of numerous convoys and task forces in the Atlantic Ocean, each represented by pins and strings. Anxiety and frustration keep him there. The pins and strings convey old information, and the Prime Minister is keen to update the situation as he waits for new reports that will change the map. He has taken to lingering in that room often in recent weeks as he and his subordinates endure the hours as battles unfold and fate tips in one direction or the other. The balance has not been kind to the Royal Navy. It is March 18, 1941, and Winston Churchill is momentarily quiet as he ponders that wall. He is dictating a radio address to the nation, struggling to find the words. He must acknowledge that twenty-two British merchant ships, nearly 120,000 tons of materiel, have just been sent to the bottom by two German battlecruisers. Those raiders are now represented as a pin on that map, refitting in a French port for their next campaign, a coordinated action intended to link forces with another ship, the mighty Bismarck. Churchill fears that ship above all others, and dreads the day he will see her represented on the chart before him. The Prime Minister takes another puff of his cigar and clears his throat, prompting the secretary to ready his fingers at the typewriter. After another puff, he continues: "We must regard the Battle of the Atlantic as one of the most momentous ever fought in all the annals of the war." Atlantic Chase simulates the naval campaigns fought in the North Atlantic between the surface fleets of the Royal Navy and the Kriegsmarine between 1939 and 1942. It utilizes a system of trajectories to model the fog of war that bedeviled the commands during this period. Just as the pins and strings adorning Churchill’s wall represented the course of the ships underway, players arrange trajectory lines across the shared game board, each line representing a task force’s path of travel. Without resorting to dummy blocks, hidden movement, or a double-blind system requiring a referee or computer, players experience the uncertainty endemic to this period of naval warfare. This system also has the benefit of allowing the game to be played solitaire, and to be played quickly. The German player’s task is clear: sever Britain’s lifeline to its overseas colonies and allies. All hangs on the fate of convoys. Ultimately, success or failure in Atlantic Chase will hinge on the Kriegsmarine’s ability to breakout into the Atlantic and find convoys while frustrating British attempts to catch his raiders. 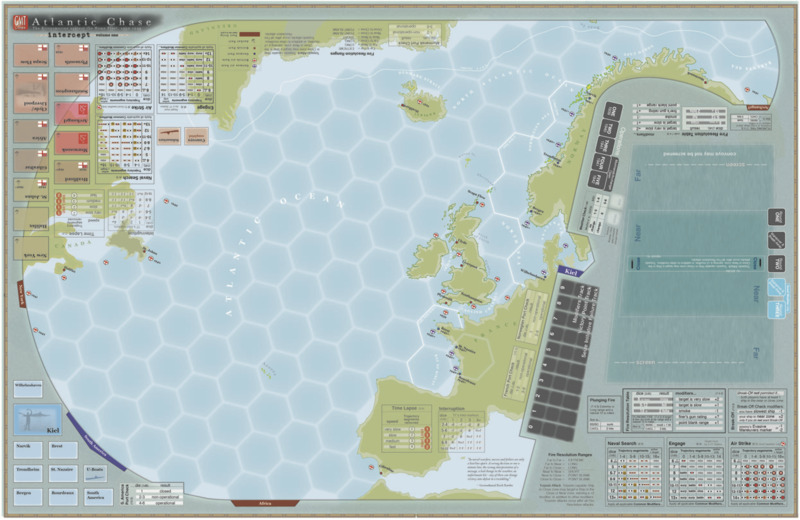 The game chronicles the development of the Royal Navy’s strategy to contain the German fleet by pitting players against each other in five successive operations that comprise a Campaign Game. Seven additional scenarios treat specific historical actions, including a Sink the Bismarck scenario, a PQ17 scenario, and the Channel Dash. The game features battleships, aircraft carriers, cruisers, convoys, and pocket battleships, while U-boats, elusive armed merchant raiders, and air assets play an important role too. Operations during the Campaign Game and stand-alone historical scenarios each take 1-2 hours to play. Will the German player do what the Kriegsmarine never managed, execute a large-scale coordinated operation knocking Churchill to his knees? Or will the Admiralty catch and destroy Germany’s great battleships before they become an unanswerable force? Imagine a convoy on its way from Halifax to The Clyde ports, maintaining radio silence. Churchill and his Admiralty know when and where that convoy launched and know its destination, but for now, while it steams east, they can’t be certain of its location. Only when calamity befalls it will the task force’s position on the map be clarified – when it is attacked by a U-boat, or an enemy battlecruiser has managed to intercept it, prompting the convoy to radio home. That prompts the Admiralty to dispatch elements of the Home Fleet to engage the German Raiders. The hunter is now the hunted, as the German battlecruisers strive to elude the Home Fleet and return to port, or perhaps double back and continue their rampage. In this game, either player may take to the offensive, and each must weigh the advantages of aggressive action against the risk of losing precious assets. Each task force on the Operations Map is represented either as a point or a line, the pin or the string. As a point, the task force’s location is known, but as a line it is a fuzzy entity. It’s location is somewhere between each end of the line and neither player knows exactly where that point resides. As a line, a task force is harder to bring to battle. Its line, called a trajectory in the game, indicates a probable course. The ships that comprise that task force are kept off map on a Task Force Display, and they are understood to be in a group somewhere between the two ends of the trajectory. To bring those ships into port, or to battle, the trajectory must be reduced to a point. There are no turns in Atlantic Chase. While a player has the Initiative, they activate task forces to perform actions, and continue doing so until they lose the Initiative. The game swings back and forth until the scenario or operation is complete, each player striving to bring the enemy to battle under advantageous circumstances. Typical of the historical events depicted by the game, battles tend to be fleeting and short, interspersed with air searches, evasive maneuvers, air attacks, and attempts to break away to safety. Players conduct actions to “clarify” lines into points, thereby determining where battles happen or ships slip into port. 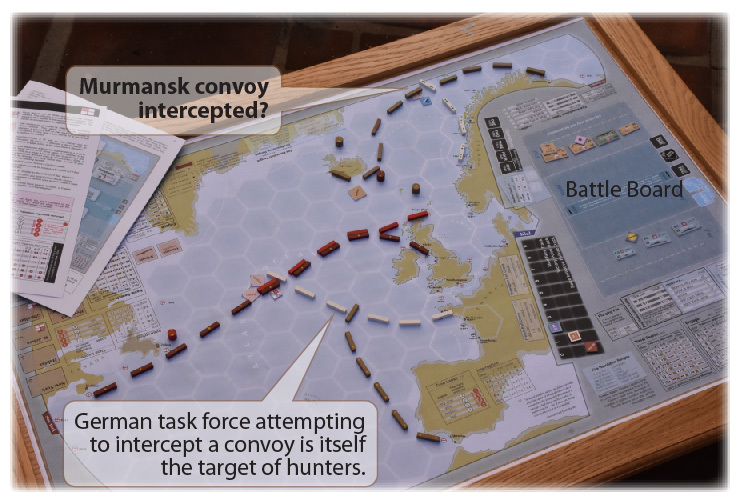 Will German Raiders intercept the convoy or will British ships and aircraft intercept the Raiders first? "In naval warfare, success and failure are only a hairline apart. A wrong decision or one a minute late, the wrong interpretation of a message, a bad change in the weather, an unfortunate hit – any of these can change victory into defeat in a twinkling."